Something About St Patrick: Amy Wellborn has put together a wonderful piece on this beloved Saint. Something Celtic: If you ever wondered about Celtic Crosses or just like to look at them Walker Metalsmiths has and interesting page about them. Something Yummy: Irish Soda Bread I add a teaspoon or so of caraway seed. The Anchoress also has some recipes that look really good. Check them out. 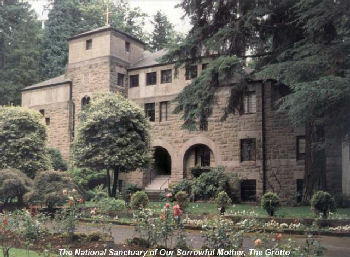 Someplace Green and Beautiful: If you are ever in Portland, Oregon The National Sanctuary of Our Sorrowful Mother is a beautiful place to visit. « How Did I Get There Again? You are currently reading Saturday Round the Web Round-up at Simply Catholic.